I love Christmas, but this year I just want to say “enough”. This season I’m all about being smarter and doing more with less – scaling back on the amount of time, energy and money I spend on Christmas gifts, cutting down on the actual number of gifts I buy, DIY-ing simple decorations and more personal gifts, and simply making do with what we have and being content with it. When it comes to crafting, I’m trying to keep the same mindset. For example, I know that I have waaaay too many Christmas themed papers, stickers and embellishments in my stash. I tend to buy new products every year and make two or three pages with them, then stash the leftovers away to be used “next year”. But next year comes along and so do new irresistible products and the stash continues to grow. I call this "Seasonal Product Hoarding Disorder" (SPHD)! 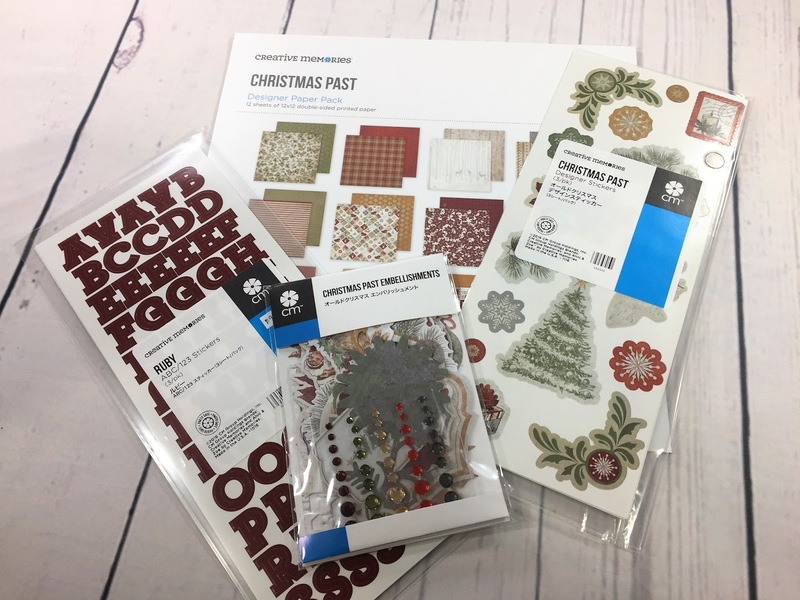 Even though I did purchase the utterly charming Christmas Past collection from Creative Memories for myself, I am bound and determined to make the most of it, and not have any leftovers to stash away! Throughout the rest of November and the first part of December, I’ll be sharing instructional posts and videos with you so you too, can make the most of your products and not have any leftovers! Order your Christmas Past products now* and gather the few additional supplies you’ll need so you can complete these projects along with me! *If you are in Canada, you can shop directly on my Creative Memories webpage. If you are in the US or Australia, you can use the consultant locator on the Creative Memories site to find an advisor near you, or email me and I can put you in touch with one of the several advisors I personally know and recommend. Today I’m excited to share the instructions and video for making the December Daily Album, and I'll be posting the instructions and video for the Christmas Countdown Favours in a few days so you can choose which project you’d like to do and get either of them prepped well ahead of December 1st! “December Daily” is a concept created by Ali Edwards that documents and tells the story of the preparations leading up to Christmas. I love doing this type of album each year as it offers me a way to reflect on and enjoy the entire Holiday season, not just Christmas Day. 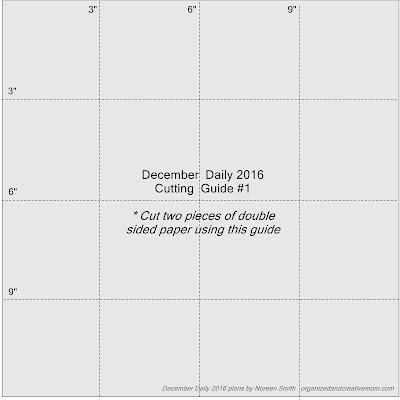 In past years, I’ve made various sizes of stand-alone albums, and have incorporated 12 x 12 December Daily pages into our yearly family album (you can see all my December Daily related posts here.) This year I am focusing on 31 simple words to help me document the season, and plan on taking one photo per day that reflects on one theme/word each day. You can use my list of words (below), come up with your own list, or simply take photos of events and daily activities that happen throughout the month and choose which ones you want to use to record your family’s story. You can find lots of December Daily inspiration on Pinterest, as well as on Ali’s website. Your choice of 8x8 album with 16 pages and protectors (Tip: if you don’t have an 8x8 album coverset, order and use the 8 x8 album pages and protectors, then purchase your album coverset the next time Creative Memories makes them available!) 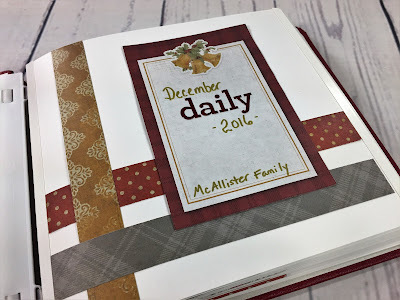 This year I’m using a Ruby Bookcloth Album, which works nicely with the colors in the Christmas Past collection. Cut out all the numbers from the number sheet. Set aside. Choose and cut out six tags. Use the Ruby ABC/123 Stickers (or handwrite with the Gold Metallic Pen) to add the numbers 26, 27, 27, 29, 30 and 31 to the six tags. Set these aside and save the remaining tags for another use. Choose and cut out one of the three journal cards. 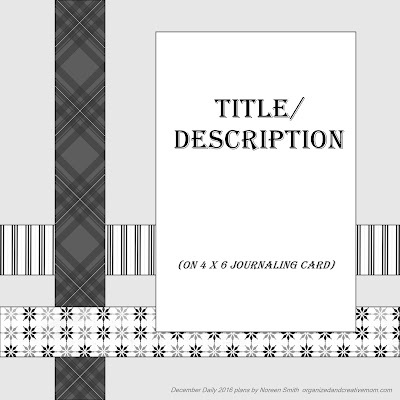 Again, use the Ruby ABC/123 Stickers or handwrite your title on the journal card. Set aside and save two remaining journal cards for another use. 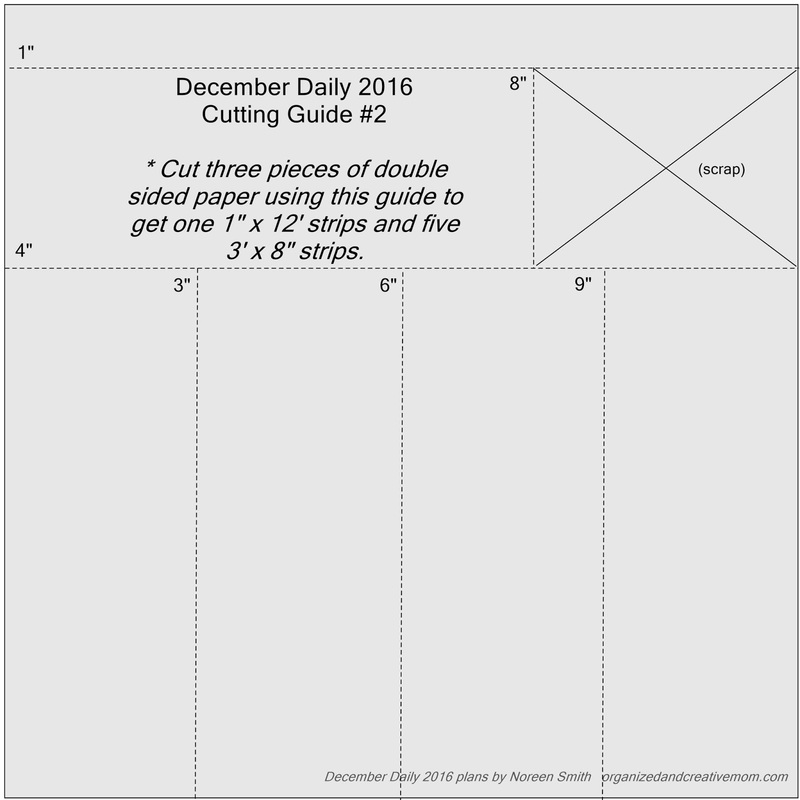 Cut two of the remaining five sheets of double sided papers into 3” x 3” squares using Cutting Guide #1. You will get sixteen squares from each sheet for a total of thirty-two squares. These will be used to create sixteen of the interior album pages. Now we’re ready to assemble the album! For the Title Page, refer to the sketch below. Trim the three 1” x 12’ strips down to 1” x 8” strips. Arrange and adhere two 1” x 8” strips across the width of the title page as shown. Add the third strip vertically, criss-crossing or “weaving” over the other two strips. Adhere the journal card you set aside earlier on top of the strips as shown. 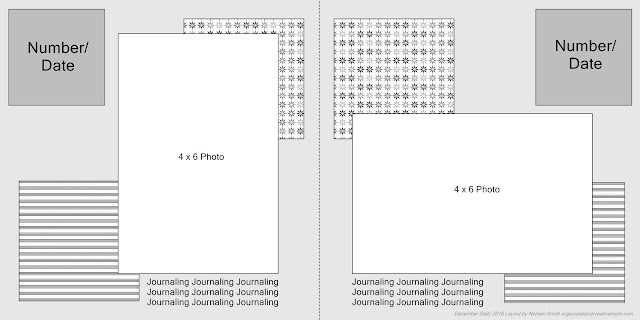 For the rest of the album, create coordinating double page spreads using the two sketches below. Adhere your squares or strips as well as your previously cut out number squares as shown. Repeat, alternating between the two sketches until you’ve filled all pages, including the very last page in the album. Now all you need to do is add your photos and journaling. 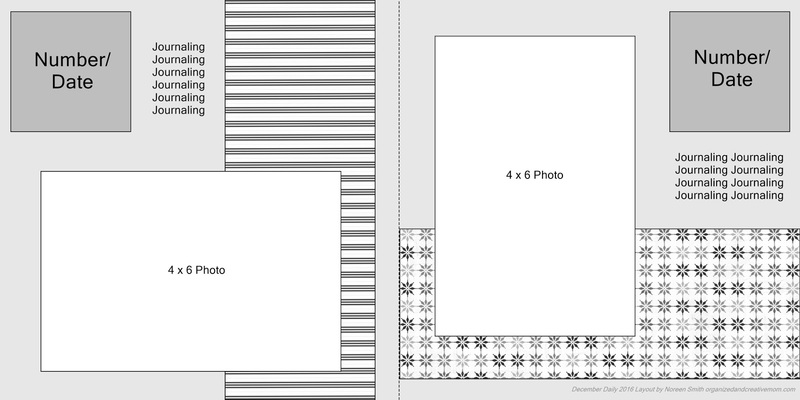 Both of these layouts are flexible enough to add your 4" x 6" photos no matter if they are vertical or horizontal! I've come up with my list of ideas or themes I want to focus on this year, but you can find lots of Photo-a-Day lists online, or come up with your own! One of the pleasures of this project is that it reminds us to stop and notice the little things around us during this busy time of year. Keep your album, your Tape Runner Adhesive and journaling pen close by during the month of December. Each week, print your photos and add them onto the corresponding day in your album. Jot down a few notes… you don’t have to write an essay for each day, just your thoughts, feelings or experiences you had. If you like, finish each page off with a die-cut embellishment or adhesive rhinestone gems from the Embellishment pack. I'll share my finished album, complete with photos and embellishments in early January. After reading this post I bet many of you are saying, “Is she crazy? I don’t have time to make an entire album in December!”, but I encourage you to try it out! I promise you that it will be a great experience and will heighten your sense of enjoyment of the entire holiday season...that's the reason I create them year after year! If you do go ahead and make an album, I'd love to hear about your experience and see how it turned out, so please make sure to leave a comment below or post a comment and photo in my facebook group! "Seasonal Product Hoarding Disorder" - LOL! I'm glad to have a name for my affliction - and to know that I'm not alone! Thanks for this cute album idea and layouts. I recently saw a December calendar with ideas for daily random acts of kindness. I'm thinking to incorporate some of those in my Daily December Album. Thanks for the inspiration! I love this idea--thanks, Noreen! Just finished your album idea! Only took about an hour and a half. I'm all ready to go for December! Thanks so much for your awesome ideas.